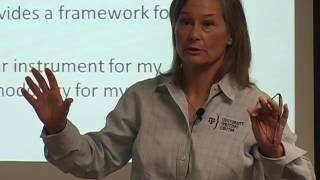 Video from the September 25th, 2009 workshop, “Get Lit” with Dr. Candace Hastings. *If you are requesting this as a workshop for your class, students are encouraged to watch this video before the interactive classroom workshop is given. We’re going to talk about a lot of things that you probably have already read about a lit review in terms of what it does, what it is, what the purpose is and so forth. And that’s kind of general information. But then I have a strategy that I think will be pretty practical I hope and show you, "Well, yeah, I know what it is and I know what I’m supposed to do, but how do I do it? And then how when I get all of these sources how to I organize them? And then how do I actually write the darn thing?" Because I think that where a lot of the information is missing. Your professors can just say do this, do this, do this, in very general terms, but I hopefully will get down into the dirt of it, get our hands dirty, and actually say, "Well how do I, what verbs do I use? How do I put these two sources together?" Okay? I’m going to tell you that I really didn’t make up any of this on my own; I’d love to take full credit for it but actually what I did was I did two things. There is a wonderful book called They Say, I Say: the Moves of Matter in Academic Writing, and it talks about how to use source material in your writing. It’s actually directed at undergraduates, but I think it’s so helpful and so practical. It’s a book. It’s like about that thin, it’s not big, and it’s not little print or anything, but it even gives you a list of verbs that may be helpful in terms of saying, "Okay Scholar X says" and we’re going to go through some of these in the presentation as well. Then I found that a lot of times the examples that they give in this book are not helpful to graduate students because they’re not in-depth enough. And also I had a hard time finding examples as well, so I found a literature review that’s in economics, which is not my field. Which I found it would be really better to pick a lit review that wasn’t in my field at all and show you how it could work in any field. Okay? So what I did was I took almost all the examples from this article, “Sociologic Economic Conditions of Poverty Crime.” So what I’ve done is taken this stuff and this stuff and just put it together. Okay? Well let’s just cover the basics just to get started with the lit review. Well, and that raises a good question because you may be doing a couple of different lit reviews. There are actually two kinds of lit reviews, but basically it’s a comprehensive examination of all of the research and all of the literature done on a particular topic. That’s obvious; you guys probably already know that. Okay? But there are two categories of literature reviews, and I want to break it down because I’m really going to focus more on one category over the other. There are two categories; one is a literature review that contextualizes a research study, and for probably 90% of you, and I’m spit-balling this statistic here, but for about 90% of you, that’s what you’re doing. You’re doing a study; you’re doing a research study, okay, in your dissertation, your thesis, whatever. Okay? Or your professor is doing a study, you know, empirical research or whatever. You are then doing the literature review that justifies the study, correct? Okay? If it’s a journal article, and you’re doing the research, if it’s a dissertation, if it’s a thesis, that’s what you’re doing. There is one other kind of literature review though, and I think it’s just important to like just touch on it and that is a literature review that is a study in and of itself. Okay? You can actually publish a journal article that is in and of itself a literature review. All right? So, for example, if there is a topic that is very mature, and there is a lot of literature written on it, and it would advance knowledge in the field to do a literature review on it, that would be helpful. There’s also a literature review where it’s a new or emerging topic and it would be helpful to gather all of the literature on this new or emerging topic; that’s suitable as well. The other part that is like helpful too, I’ve seen some literature reviews that combine, if there’s a topic that’s interdisciplinary and nobody has looked at the interdisciplinary part of it, they bring in multiple disciplines on the literature review and advance the knowledge that way. That second one is not really what we’re going to talk about today, but the concepts will apply. But most of you are guys are in the boat where you have to write a lit review for your dissertation or thesis or a journal article, okay? All right; let’s move on to the next step. What’s the reason? Why would you write a literature review? Well, my professor told me it was part of my dissertation; it’s a chapter in my dissertation. Well what is it for? One, it establishes what is already known about a particular topic. And, two, what methods have been used to research that topic. Okay? And then also, when you’re doing your research, if you don’t do a literature review first, how do you know you’re not duplicating what somebody else has already done? That’s bad because then you go to your chair and you go, ‘Here it is; this is the last six months of my life’s work,’ and they go, ‘Yeah, but Smith did that three years ago. Smith and Wesson did a study that’s very similar to yours, and you know, start over, right? So you don’t want to get in that bind; you want to do your literature review. It’s a matter of front-end loading versus back-end loading your work; you want to front-end load your work; you don’ t want to reproduce what somebody else has done, unless you are reproducing a study that somebody else has done. A lot of times you use the same methodology and you get different results. In the sciences I think this is done, but you still don’t want exactly the same thing to happen because then you’re just replicating, okay? It also exposes gaps in literature and helps you position your research. In your dissertation or your thesis you’re supposed to come up with something new, right? Okay? Well, how do you know what’s new? How do you know what’s new? One of the last slides I’m going to show you is how to find the gaps in the research because I think that’s a little difficult. I’ve done several literature reviews, and these are the questions I ask myself. And these are the questions that people ask me. I think the big question is how much literature do I need to look at? I could spend probably the next five years of my life looking at the literature in this field and that’s depressing, you know? So how much, what related ideas do I need to explore, subtopics, or overarching ideas? A lot of times you’re looking at a topic, but that topic has subtopics, correct? Or that subtopic has overarching topics. How do I know, okay, how do I know that I need to go to related ideas? Well you just need to start swimming in the literature and figure it out. Let me give you an example from my latest lit review. So I’m looking at plagiarism, okay, you know, just the concept of plagiarism, but what I really started with was academic dishonesty. And I realized that that was too big a topic, and I got myself in the literature, and I got myself in a real tangle because there was so much literature on it and I go, ‘How am I going to write about everything? I can’t.’ Okay, is there a bigger topic that I need to look at, or is there a subtopic that I need to look at? And one of the things we were talking about before this started was the idea that you’re trying to decide on your dissertation topic, and then you need to do your literature review. You may swap that: you may go ahead and start the literature review, and then expose a gap in the literature and find your dissertation topic. This is what happened to me and it was really helpful. Is there certain literature that provides a better couch for your study than others? And that’s how you can also discriminate whether you’re going to use a piece of literature in your literature review. And a related question that may be a duplicate question, but more practical for you is, why use a particular instrument for my study, or why use a particular methodology for my study? Okay? In the hard sciences if you’re looking at laminitis, which is really fascinating to me. If you’re looking at laminitis, scientists have been looking at this for a long time. Have they been looking in a different way at the problem then you’re looking at it. He’s using a new method or approach, so why use a different method? Because the other methods haven’t worked. See what I’m saying? You only know that when you look at the literature, though. What’s been done before to tackle my particular research topic or problem? And the next step is finding the literature, that would be good, you know. Some of you have found too much literature, and we’ll deal with that in a few slides. But finding literature, how do you know you can find. One of the things that I think, and I’m going to show you the details for everyone of these suggestion, but one of the things I think is sorely underutilized is your subject specialist reference librarian. When I talked to the reference librarian and the subject librarians they go, ‘We just want people to come see us, we love to work with people!’ So they’re like waiting for you, their arms outstretched; let me help you. Okay so take advantage of that, it’s free. The other thing that I think is helpful is how do you find then also then good sources? I swim through those databases, the library databases, and I’m completely overwhelmed. How many of you guys find that to be true? I look in there and I do like a search, a topical search; and I get 18,000 hits, and I go through and I go well how do I even know that this is a good source? How do I even know that this is something that will be helpful to me because one of the things in your literature review is you the question asks how much literature do I need to look at? You’re not going to be able to look at all of the literature if you have a big topic, correct? So how do you know who are the scholars that you really need to cite? And really you want the big players; you don’t need to mess with the little guys; you want the big scholars, the big players in your field, correct? I don’t’ know about you guys but when I first research a topic who the big players are, do you? I don’t know who the big players are. Ah, but Google does. If you go to scholar.google.com it is not comprehensive. Your databases, your library databases are a lot more comprehensive than this, but as a starting point, these articles come up, these books come up. And right here it says cited by and there’s a number; this says citied by 45, so that’s 45 other scholarly sources cited that source. So if your overwhelmed with the amount of literature you’re looking at, you only want to find the big players in the field right? So if it says cited by two, which that would be my journal article, you may not want to use it. But if it says by cited by 60, cited by 200, right? Then you go “ahhhh,” maybe this person is somebody that people are talking to and talking about. And all your doing is your tapping in to the conversation and your trying to find a place for you to join the conversation, you’re trying to find a little hole for you to fit into. Alright? This is a real quick and dirty way of finding the sources very quickly. Once your very familiar with the big name players in your field, the people that are talking the most, the most respected, the most controversial, whatever, whatever your actually looking for, then go back to the library database, then you can do your searches, your searches then can be much more refined because maybe you just want to find all the articles from Donald Mckay because he’s the biggest player in academic dishonesty research that you can find. Then your going to find related articles to that article, see how it all kinds of webs together? You can find dissertations written on your topic from your department from Texas A&M just like that. Okay. Why is this helpful? I wanted to find out, I wanted to read dissertations supervised by my chair and other members of my committee. Now that’s a little bit outside of the literature review but you understand why I might want to do that? I want to know what they’re going to be looking for, what’ they’ve signed off on, that kind of thing. I also want to know what a dissertation in my department looks like, okay? Now, there are all kinds of methodologies you may be using you may find you may go ahead and look for a dissertation or a thesis with even the methodology and so forth, there’s a lot of things. But at the very minimum, to bring it back to the topic were talking about today you could look at a dissertation from you’re department and your field and look at the literature review and see what It looks like. Particularly those where your chair or your committee members have supervised those other students. See what it looks like, see what your committee members are going to expect because lets be honest you guys you know your committee members sign the paperwork, correct? Right? They do. And, and, and you want to be in line with there expectations okay? Alright. So what you do here is you just go to the library, just the home page you pick up the database one, it says search for databases, and it says Proquest dissertation so you can look for school: Texas A&M University. You can look for the terms in the abstract or you can actually look for the terms used in the document text, so your topic end, did anybody at Texas A&M in my department or whatever at Texas A&M, write a dissertation with this topic used in the text? I think that this is astronomically helpful and a lot of people don’t know about it. And it’s a way to do your homework before you do your homework. Aright where are we now? We know we have to do a lit review, we have gone to the library databases, looked at the subject librarians. We actually have stacks and stacks and stacks of printed pdf files in our house in our car in the back seat. How do you wade through all of that stuff especially if you have a lot of it? Okay so the deal is you want to find out what scholars are saying about your topic, and we already know how to find the good ones, the big players, Google Scholar. What are the ongoing debates or conversations on your topic? Okay? Is anybody talking about your topic at all? Okay and if they aren’t why? And that’s something to think about in terms of making choices, and if people are talking, whose talking and what are they talking about? This also helps you organize your information you have a copious amount of information when you’re doing your literature review. You have lots of information and Brandy and I were talking about this earlier, that we gathered all the information then we took a break from the literature review and when we went back we had no idea where to start again because we had forgotten everything that was in every article. We didn’t really forget, but we kind of did because you almost have to be concentrating on that topic intently. You have to be thinking about it and thinking about it and you go okay what does so and so say and what does so and so say and what does so and so say okay? So what are the ongoing debates within your topic and it may be if your in the hard sciences it may be about methodology, why does this methodology work better than this methodology? Well this study was done but it didn’t do any good, and if your in education there’s a lot of theories in education, education, they love theories well the theory is this, well this theory may not be adequate, does this theory work? Theory, theory, theory, right? What ideas do you agree with? ‘Oh my gosh this guy just has all the answers, you know? This is perfect, whatever I do, he gets it, or she gets it and I’m going to follow that.’ And hopefully once you do a lot of reading you go ‘oh no, no no no, that would never work; I can see why they haven’t solved the problem because they’re not looking at it in the right way’ correct? And then, this is probably the most important question if you’re looking to the literature: what hasn’t been said about your topic? Because really what you’re trying to do is find your little niche. What are you going to right about? What are you going to study? You don’t want to say something that’s just been replicated. Organizing the writing of your literature review is probably the most difficult thing that your going to tackle, I think, you know? ‘I’ve got all these articles and I’ve read them all and I don’t know where to start? I have a couple of suggestions. You probably have good sense of where the conversation is you know you’ve done all this work, you’ve done all the reading, you probably have a sense that this scholar doesn’t agree with this scholar and this researcher used this methodology but didn’t accomplish what you think could be accomplished with this methodology. Or maybe its been looked at in this way but not in this way and you think that this would really solve the problem because somebody else looked at the problem this way. I was helping a student with her thesis, and she is doing a study of what’s called “bull switching” in a waterbuck herd. Basically they bring in a male for breeding season. They only want one breeding season to help with the health of the water bucks and the survival of the calves, so what they do though to keep the herd in tact is they take the bull, bring him in to this breeding season, then remove the bull and bring in a vasectomized male for these waterbucks, okay? Well she had to do two things: she had to research bull switching in other species because it had never been done in the waterbuck species, and she was observing the animals in a semi-natural environment as opposed to the wild, as opposed to a zoo. She was looking at it a Fossil Rim Park, which is a semi-natural environment where they don’t want you to interfere with the natural wildlife, but they do some interference, right? She found literature on, you know, bull switching in waterbucks, she found no literature in bull switching in semi-natural environments, she found no literature…you know what I’m mean? This is really great research that’s she’s doing, but doing the literature review was very very difficult because what she had to do was pull from other areas and say okay, ‘what work has been done on animals in semi-natural environments?’ Pull that in. It seems almost unrelated doesn’t? But she had to do it because there was nothing in her field. What about breeding, what about breeding in semi-natural environments? You see she had to look at all of these things. Once she got that together though she said, well how do I talk about it right? Her problem is probably not your problem, her problem is that she had to really stretch on the lit review. For most of you guys, you’re going to have too much literature on your topic. So how do you organize it? Well one of the ways you can organize your lit review, and your going to have a little overlap, but one is to look at the materials sequentially, what happened first, what happened second, what happened third. In Ed. psych sometimes this is helpful because well they used to think, you know, researchers did this experiment and they used to think that students did this in this way. But now research shows it’s very current, you know your always looking the current stuff, the new stuff, research shows now that this works better, okay? So sequential is not a bad way to go because you look back at what’s done before. It won’t be all of your lit review though, you know, and it may not be applicable to your lit review at all. Sequence may not matter, okay? What may matter is topics, so you look at your topics and your sub-topics and you go topical, okay? Maybe you want to talk about research in semi-natural environments. Doe-switching in semi-natural environments. So you’re looking at all of your sub-topics so that it makes sense when you get to the end that your reader understands why you’re doing the research your doing, okay? Topical. You’re going to do some topical no matter what. Methodological. No other strategy has worked. They’ve tried this, they’ve tried this, they’ve tried looking at it quantitatively, they’ve done bootstrap analysis, they’ve done regression, they’ve done qualitative studies, they’ve done this, they’ve done this, they’ve done all kinds of this, nothing works but my method will. See. And theoretical. This is mostly for the education people and the social sciences. Theory, theory, theory, this theory, this theory, this theory. I don’t think that you’re going to use one or the other; I think you’re going to use a mixture of maybe all four of those, but it’s a way to get started. So lets get rid of all of this stuff, okay? You’ve got PDFs everywhere. You know what they say, but you’re kind of confused. Put them down, put them over here. I’ve got three articles that talk about this topic, I’ve got four articles that talk about this topic, and I’ve have one article that debunks all of those articles. So then you have something to write about. You can write at least a couple of pages, and you guys, you don’t have to write the lit review in one day; if you try to do that you will…don’t know what you’ll do. Take it little bitty steps at a time; see what you can do in one sitting, and then move on and then move on, and then move on. Think about okay, what do they say? What do they say? This is what we’re going to do; this is where that they-say-I-say thing comes in. What do they say, the scholars, how do I agree or disagree with them okay? Okay what are the experts in the field say about x? You can say the results of Hester’s study contradict the findings of Smith. What are common place opinions on x? Most experts believe that the stock market will continue to weaken over the next six months. What do others, what do scholars imply or assume? Sometimes my opponents assume that most young women simply don’t want to play sports at the collegiate level. This is from a lit review that I did for a journal article, and then what I said was they assumed it but its not true because of the methods they used to research. What are both sides of the argument? Well this scholar says this, and this scholar says this. That’s where you start you guys. That’s where you start your literature review. Don’t think about anything else but that at this particular point. What do they say? Now I didn’t put any citations in here of course you’re going to cite your sources. I’m going to show you, this is from the economics piece. This is an example from a real journal article, a real lit review that starts with one of those standard statements and then leads to placing that statement into the larger conversation. And it says, ‘Economist Shelly associated absolute poverty -I left out some of the stuff- to the individuals expected benefits from legal and illegal activity. Therefore, absolute poverty may create the perception that one skill is relatively more productive than criminal activity. That’s a general statement. Look at the transition then. In addition now all I’ve done is, you know you make a general statement – this is like standard thought in the field. Now I’m getting into my lit review and I’m going to say okay, now I’m going to add a detail to that general statement and I’m going to use Lot. In addition, Lot postulates that the poor are more likely to engage in criminal activity… yada yada yada, and what am I don’t here? Basically I’m then shifting, I’m saying okay this scholar is saying this. Your looking at now both sides of the topic, or all sides of the topic, and you’re saying okay this is the general thought about this, this is what the scholar says about this, but this scholar says this. Okay? Easy, just using transition words, general statement leading to…now you’ve got two sources out of the way. You only have about 50 or 60 more. No big deal. I’m just kidding. Now what you can do is now what I’m doing is, however, and I’ve randomly excerpted these from the article so don’t feel that you don’t understand the article because we’re not going in order at all, okay? The author of this lit review says this stop in contrast, I’m switching directions here, in contrast to these views, other researchers hypothesized that community and family structure linked to property crime only if they are associated with relative poverty. General statement correct? For example, now I get to use a source again. A literature review is not an annotated bibliography, because annotated bibliographies do not position the literature, okay? They just state what the literature says. Your job on a literature review is to position the literature and show that you understand the conversation, okay? That’s the difference. That’s a really good question. Actually doing an annotated bibliography is not a bad way to start your literature review. It is a way to stay organized but the annotated bibliography is the first step in gathering the information and summarizing it. Then the next step would be placing it within the conversation, okay? Meta-analysis has a different meaning in the sciences in terms of like; really you’re talking about a lot of studies and then dong a statistical analysis. But what I mean here is just looking at all of the literature all of the little sources they all basically say the same things or they’ve tackled the same topic in the same way. This is from the economics article. Here’s the statement: empirical results from crime studies generally support a positive relationship between absolute poverty or relative poverty and property crime rates. Now what he has done in this article is all of the sources that this author has cited here, they all have empirical studies, they’ve all written articles, they’ve all done empirical studies that result, you know, the conclusion is that there is a positive relationship between absolute poverty and property crime rates, okay? So when you say how much literature should I have if all of these people have done the same study or similar studies and they’ve drawn the same conclusions this is how you site it; however, empirical support has positive effects is not universal. Not every scholar or researcher has found this to be true. Gillespie evidently did not, either that or Gillespie is countering this argument in Gillespie’s research. So once you’ve gotten the breadth and once you’ve done the annotated bibliography you can see this pretty easy. You know, it’s going to come together for you after that. How then to attribute the sources? Now, all of you are from very different areas. Some of you are going to use IEEE, that’s an engineering style. Some of you will be using MLA or APA, some of you will use a journal article and basing your citation style on that journal article, I can’t make any given statements about exactly how to cite your work. The piece that I’m using is using APA. It’s from economics, social sciences, so that works and sociology, but what I can tell you is when you’re using source material there are two ways of attributing the source, and I think this gets to your question. One, you either use the scholar’s name in the text, or you use the scholar’s name in the citation, one or the other. Those are two choices. Pretty easy, okay? My first one says scholar x, and now here’s a list of verbs you could even use. Scholar x acknowledges, argues, believes, claims, concedes, demonstrates, disagrees. That’s a whole list of verbs you could use any of those, they’re free. Take them; use them, no big deal. That’s used in social sciences more because if you’re talking about theories there will be a person or a scholar associated with that theory, does that make sense? If you’re in the hard sciences, a lot of times that is going to come in the next one – attributing sources within the citation, ‘transformation learning,’ although that’s not the example I used, but ‘transformational learning creates an opportunity for learners to experience the life changing moment that will change their life views’ (Smith 1987). A lot of times when you’re talking about sciences you’re talking about this methodology was used in this research yada yada yada. Maybe you’re using the passive voice, I don’t know, and you’ll put the citation at the end. Some of you use the miracle citation, the science citations where you use the one, two, three and you just go back to the one every time you refer to that source. There are all kinds of ways to cite materials, but there are only two ways to attribute in the text or in the citation, one or the other. Yeah that’s a really good question; what I think is you’re going to need to use common sense because what’s most important is that the reader understands where that information comes from. So if you have a paragraph and it’s coming from three different sources, if it’s a meta-analysis: they’re all saying the same thing they’re all the same results you can put it at the end, right? But if you’re mixing it up and you’re talking about this idea or this result and then you’re going to another one, put the citation right after the sentence. And then go on to the next idea. Put the citation right after the sentence and then so on. Because what’s really important is you don’t want to deceive the reader regarding where that information came from, it could really mess you up, like I said if it’s a meta-analysis you wait until the end. If it’s one source and one paragraph then it’s pretty clear that all of that information came from the same source; you can usually go ahead and wait for it at the end. If you are in the social sciences, what I do, just to make it really clear, in education, social sciences, humanities, history, those kinds of topics, I then say scholar x says yada yada yada yada, okay? If you’re in the hard sciences you may not be using scholars names to be referring to your literature, then you’re going to want to wait until then end, but I want to make it clear to my reader that this is so and so’s theory, okay? If you use quotations a lot of you guys won’t be using quotations, but if you do use quotations here are some really easy ways for entering, just attributing, your quotations, okay? Scholar x states, says, writes, complains, and then the example is yada yada and then the scholar y disagrees saying humma humma. You can also go back to that list of verbs and put any of those verbs that are appropriate. Definitely don’t want to throw a quotation out there and let the reader interpret it. The burden of proof, the burden of the explaining the quotation is on the writer not the reader. She goes ‘this is a really cool quote, it says everything I wanted to say, it’s so important, I have to use, it its brilliant,’ okay? After you say it or before you say it you’re going to want to explain it. Well you know this is a lot of information, a lot. How do I guide my reader through all of this information because it’s pretty easy to throw the literature in here, but it’s really difficult to make your reader understand the way it goes, you need a road map, right? Like that’s what we were talking about the however, now turning directions, in contrast, in addition I’m going the same direction, however I’m changing directions, therefore I’m drawing a conclusion. You got to guide your reader, okay, because if your reader gets lost and your reader is your chair you’re starting over. So I have three ways of doing this when I write, okay? And I think these are pretty helpful. You can use pointing words, first of all you want your topics to flow together, but that’s what we were talking about sequential methodological and those kinds of things. Now we’re getting down to the sentence level stuff rather than the paragraph level stuff or the page level stuff, now we’re getting down to the sentence level stuff: pointing words, transitions and conjunctive adverbs. Using pointing words, pointing words are for back to a concept you’ve discussed in the previous sentence. You want your reader to know that you’re really still talking about the same idea, but you want to avoid ambiguity sometimes if you use the word this, these, your reader doesn’t know what this is referring to. If you use it alone it should be absolutely clear what idea your pointer is referring to, you can name the pointer as follows to eliminate confusion. So if you’re talking about the debate between scholars on this topic, you could say this led to yada yada yada, but ‘this’ is not clear what it refers to, you could say ‘this debate,’ ‘this argument,’ ‘this methodological process,’ you know? Whatever you’re talking about in the previous sentence use a pointer to carry your reader in that direction, okay? This debate is not settled because each of these theories has both empirical support and opposition and then the citations. Alright, I’m going to just show you a couple of transitions and just somethings that you could do, and I got this from the lit review from the economics piece. In contrast to, great transition, in addition to, all of these things guide your reader, ‘oh now I’m changing direction,’ ‘I’m going the same direction,’’ I’m drawing a conclusion.’ You need to pretend that your reader is not very bright. That’s what my professor told me, he goes, ‘you’re really making a lot of assumptions about how bright your reader is.’ And I was like, ‘Well I thought so.’ No, make a road map; make it explicit where you’re going. Now I’m changing direction; other authors claim that absolute relative poverty has only conditionalized property crime. So I’m going through here and contrasting his views and theories postulating relationship between absolute relative poverty and property crime yada yada and this is what everybody thinks. But other authors claim that they only have conditional links to property crime, and I’m proving that by citing the literature on that. I like this example because this debate looks at both content and method and sometimes you will be looking at disagreeing with the content and the method of what’s going on. This debate, the pointing word right, is not settled because each of these theories has both empirical support and opposition, you saw that before. Even Canter and Lance’s attempt to combine these opposing views, like ok, their is support and opposition. Now there’s a study done that tries to combine the support and the opposition but Hale and Sabba criticized Canter and Lance’s methodology in their study. That’s getting down to the detail isn’t it? If you get this far down into the argument you are almost ready to take your place in the conversation correct? You know enough about it to know where the controversies are what’s been done, what’s not been done, and now look what your topic is going to be, okay? Finally, the point of the lit review is to get to your dissertation topic or your thesis topic or your journal topic your justifying it, okay? I’ve looked at everything; I know everything that’s out there; I’m telling you everything that’s out there. You’re an educated reader and you guys I’m going to tell you something about your committee members. Your committee members know usually a lot about the topic, but they may not know everything about every theory that you’ve looked at and considered so you need to be explicit about that. I knew that I had to be very explicit in my literature review because I was making the assumption that all of my committee members knew everything about everything that I was doing. They don’t because you probably have an expertise because you’ve been spending so much time on that one tiny topic. It’s very important to realize that, okay? So now you’re going to place yourself in the conversation. Your voice is going to be a part of the conversation and then you’re going to show how you build from all these ideas to justify your own topic. Okay, so we’ve talked a lot about what other people say, as you do your literature review what do you say? Well theory works. I like what you said, you said ‘well they haven’t been using the right methodology and that’s why they haven’t gotten to the root of the problem and I’m justifying my study that way,’ piece of cake easy, alright? How do I agree with this scholar about this topic but with a difference? How do I disagree with this scholar? You guys I’m using the term scholar but really if you’re in the sciences more than like you’re going to talk about studies. I disagree with this study because they didn’t look at this. I disagree with this study because they left out this variable; this methodology, this statistical, they didn’t choose the right statistical method to analyze that data. But if we take the same data and we look at it a different way, it’s going to yield a better result. Do you have something that you’re going to have to give up? Is there a point that you’re going to have to give up? There are some things where I said, well I would love to do this but that is not possible, so I’m doing this because it’s as close as you’re going to get to that. How do you justify a short study or whatever? And then how do impart the importance of my argument? You should be passionate about what you’re doing. The other thing you’re going to want to do is draw conclusions. So you put yourself in the argument and then you draw conclusions and say this is what I’m going to do I’ve looked at all of the literature these are my parameters and strengths and this is what I’m going to do. This is another way to get yourself in there; exposing the inadequacies of the current theory the empirical literature on the impact of local crime rates is not as decisive as these theories would suggest. Gosh, you know, the conclusions are not that great maybe there is a new study out there waiting to happen. And then sometimes you just have to yank a gap in the research. Sometimes you find a gap in the research; sometimes you have to make a gap. Here’s how you make a gap the theoretical literature does not support a particular relationship between property crime and socio-economic conditions limited by the particular theory and related variables chosen for analysis. The empirical literature often provides support to opposing theories, so what you’re saying is the theoretical literature, there’s not really consistency there, and the empirical literature also shows – has different results, so hmm what am I going to do for my study? Maybe I’ll come up with a new theory or maybe I’ll find a theory that has not been looked at and tie it to empirical studies. This is where you kind of think, you play with it, you lay it out on the table and you say what’s not been done and where are the holes? Sometimes you just find that things haven’t been studied and that’s so awesome, okay? Not analyzing cross sectional data times series studies, empirical evidence on inflation effect is meager, is meager, it’s not out there. Tada! I have a dissertation topic, right? I have a journal article just waiting to be written because I’ve done all the literature review and I’m brilliant. Position your research, if you’re doing a journal article, if you’re doing a thesis, what your doing is your exposing all the gaps then you go put yourself in right in that gap, right in the hole, okay? Sweet spot. If contextual situational issues play a significant role in determining the level of academic integrity in their classes as McCabe asserts, and I’ve spent in this particular piece, I spent several paragraphs proving that point, I didn’t just make it up, you know? Then faculty are an important part of the academic integrity equation. Research on faculty perspectives on cheating in general and plagiarism in particular few and far between citing a bunch of people. There are four, draw a conclusion, I’m placing myself in the research, nothing happening in the research on this topic people. Therefore it is the goal of my dissertation to focus on the insights, views and perceptions of the faculty that are often forgotten component of research studies on plagiarism. I just justified my topic, right? To gain greater insight into how faculty view plagiarism in their classes and more importantly how they exist and teach. Now I’ve got my research questions as well in the second half of that sentence we’ve looked at this in a macro way, but then we’ve gotten down and looked at the very fine details about how to write this thing. We spent a brief time talking about actually how to pull this off, but I’m not going to lie, it’s a lot of work, you know? And you’re going to find times when you get really frustrated. And you’re going to find times when you go I’m so overwhelmed or underwhelmed because I can’t find a darn thing on this, you know, that I just don’t know how I’m going to, you know, move on. Just breathe, that’s my advice, just breathe, and try not to tackle everything in one day. Say I’m going to work on this topic today, or I’m going to work on finding a source that will tell me. I’m going to find that source that’s going tell me my three-month study is adequate, you know? Or I’m going to find this study that’s going to help my find this, or I’m going to put together all of the arguments like against this way of doing things. That’s a good days work don’t you think? That’s a whole days work right there if you do that, take the next step, the next stair, the next week, the next step the next day. It’s daunting, and if you don’t break down the task it tends to be blocking. You get so overwhelmed with it that you have…your blocked. Back up, breathe, use just some specific strategies from this and go, one, I’m going to do one thing here. Now when you get to step nine or ten you may go back to step one, I’m going to redo step one, but at least you’ve already gone that far okay? You know, don’t give up. Thanks for coming sure appreciate it.